Leeks are a member of the onion family, but with a long, slender shape and sweeter taste. Serve this healthy vegetable on its own as a side dish or use it in recipes as a flavorful ingredient. Because leeks contain both vitamins A and C, cooking them in a way that preserves their nutritional value can be tricky. Blanching is a way to shock, or cook leeks to a crisp tender stage quickly without significantly affecting their vitamin content. Fill a large soup or stockpot with water about three-quarters full. Bring the water to a full boil on the stove. Add two trays of ice cubes to a large bowl and fill the bowl with cold water. Drop clean, trimmed leeks into the boiling water for 30 to 40 seconds. Remove one leek with tongs. Insert a sharp knife blade into the stalk to test for crisp tender doneness. The knife blade should go into the stalk under gentle pressure. Continue boiling, if necessary, testing for doneness every five seconds. Remove the leeks from the boiling water with tongs and immediately transfer them to the bowl of cold water for one to two minutes. This will stop the leeks from cooking any further. Empty the cooked, cooled leeks into a colander to drain. 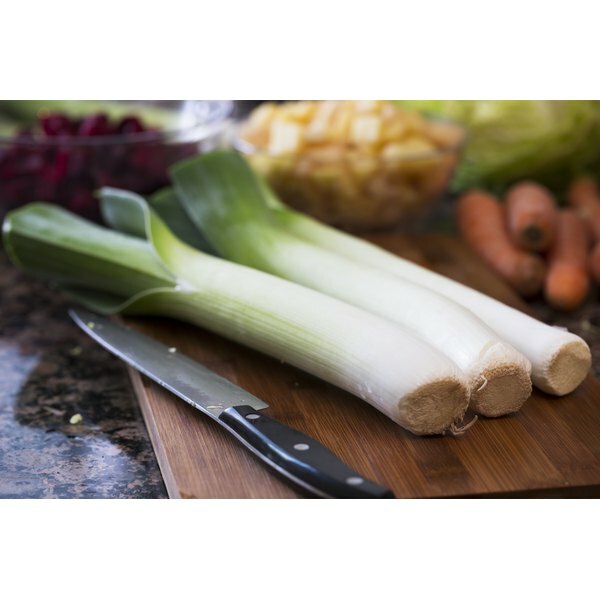 Prepare leeks for blanching with a quick trim and a good rinse. Slice ¼ inch from the base and cut off the leafy top section of each leek. Remove any light green or yellow stalk leaves, then wash the leeks under cold, running water. Pay close attention to cooking time as overcooking can cause leeks to become slimy. If you plan to serve leeks as a side dish, transfer the leeks from the boiling water to a colander to drain and serve immediately.